In the heart of Negros Oriental lies a real tale of enduring love. This true-to-life story has proven that sometimes, life takes unexpected turns. Yet, life is too short for us not to make the best and most out of everything that comes our way. Grace Myriame Sycip grew up in a sugarcane hacienda in Manjuyod, Negros Oriental. All her happy childhood memories were built from there. She used to swim in the pond, ride horses, and take a morning stroll with her grandfather. The happiness she had as a child, however, was a stark contrast of what she experienced in her grown up years. Left with three children from two failed relationships, Grace was sorrow-stricken with how her marital affairs fared. Things became worse when her father got sick, their ancestral house near foreclosure, and their farm in shambles. She hardly knew how to go forward, what to do, or just what to think of to bear her agonies. A traditional and bucolic town is a difficult place for new beginnings, but she mustered the strength for the love of her children and the support that her family continually gives. Grace found her calling in helping couples plan their dream wedding. And she found peace in serving God through the ministry. That same ministry led her to the man that she never thought would still come in her life. Jun Marcial Romano came from a decent working class family. At a very young age, his parents instilled in him the value of hard work and responsibility as he toiled in their own farm. This paved the way for him to be successful in his vestures, allowing him to eventually setup his own food business. Yet even if he is busy managing several branches in Dumaguete (Negros Oriental) and Bacolod (Negros Occidental), Jun managed to offer both his time and skills to the same ministry where serendipitously, Grace belonged. Jun managed to find time to Like Grace, he found joy in serving God and willingly offered his skills to the ministry in their congregation where Grace is also very devoted. Jun and Grace started off as co-workers in the ministry. Once, a structure has to be built in Bacolod, where they both volunteered without knowing that this task is a blessing in disguise. Amidst the construction work, friendship bloomed. This friendship continued and became stronger that others cannot help but see how they complement one another. The two did not welcome the thought of falling in love with each other, until Sister Bing, a church elder asked for both of them to be present in counseling. “That was the weirdest counseling session I have ever attended,” Jun said. He recalled how Sister Bing told them that they seem to be attracted to each other, and that they should talk. It is easy to understand why Jun put aside that thought. “Knowing Grace’s circumstance, it’s complicated,” he said. It was not until after six to seven years of working with Grace in the church when Jun started to ask himself— “Can it be Grace?” Long years made their bond of friendship stronger. The painstaking efforts Grace exerted for the ministry made Jun realize what a beautiful wife she will make. “Grace loved the Lord so much, the Lord that I loved. It’s nice to grow old with this woman, and with her by my side, I know I will never be astray,” Jun lovingly recollected as he pointed out what she loved most about Grace. “She sees the good side of life,” he added. In 2011, Jun approached Grace’s parents and respectfully asked their permission to propose to their daughter. “I was flabbergasted because Grace had two failed marriages already,” Grace’s mom remarked. She continued, “But there was constantly one man who is always there for us even if we did not ask him to be there”. Grace recollected how Jun rushed her father to the ambulance and wept with her father consolingly that night in the hospital. During that moment of emptiness, she blamed the farm for all the misfortune that befell her family. Yet, her perspective changed when Jun finally confessed his ardent love for Grace. “I know things just fell into place because of the grace of the Lord in my life. I know I stand only because he picked me up from where I used to be,” Grace admitted. Indeed, Jun proved to be a loving husband-to-be, in times of crises and festivity. The dashing bachelor gave his future bride free rein with the wedding details, which Grace enjoyed being a wedding coordinator and stylist herself. 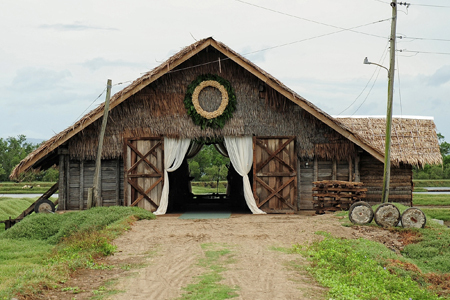 Grace was thus able to achieve her dream of Spanish Hacienda themed wedding. The whole family cooperated in transforming their stockroom (bodega) into a ‘quaint rustic looking chapel’ that Grace visualized. Grace’s natural beauty stood out as she wore the pina bridal gown created by her friend John John Ditching. 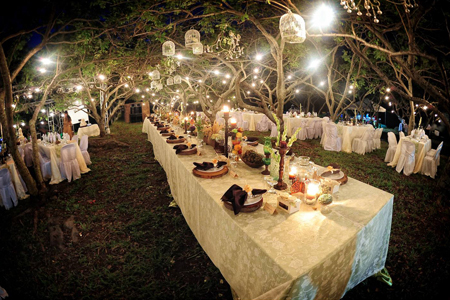 The reception took place in the soothing wilderness of the siniguelas trees that stood the test of time in the sugarcane field. The rough roads were turned into driveways and three hundred bamboo torches were lighted to guide guests driving up the mountain where the field is located. 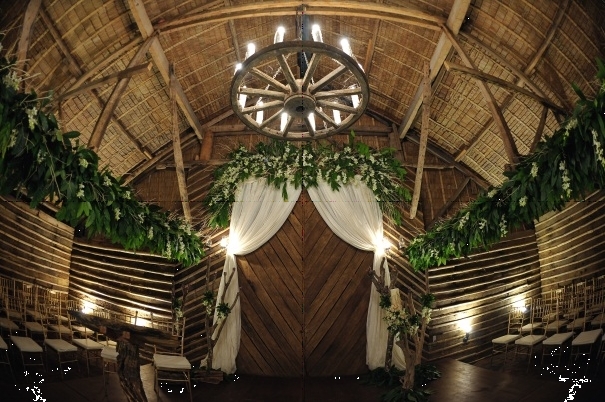 The ceremony and reception area were proof of Jun’s passionate love and Grace’s outstanding creativity plus excellent taste, just perfect to turn a sugarcane field and storehouse into a romantic setting. From the mango jams and cacao chocolate nibs farm products that they gave as favors and souvenirs, the demonetized arrhae centavo coins that Grace collected when she worked before in a bank, and the locket tied together with the bridal bouquet, all the other wedding details are significant part of Jun and Grace lives. The couple was confident as they exchange their vows before God, families and guests. “I will always be second in the life of Jun. The Lord will come first. A man who loves the Lord first will always love his family,” Grace proudly commented. Now, she sees the hacienda as a venue to build the lives of the people, in the same way that her heart has been rebuilt with Jun’s enduring love.